Our favorite time of year has returned, the 2nd annual Blairvember is upon us and what better way to start than a pairing between two of our favorite Grindbin All Stars’, Linda Blair and Dan Haggerty? The Chilling is shocking in it’s ineptitude. A movie that fails on every level of basic filmmaking in such a glorious way that it falls within that sweet line of so-bad-it’s-good entertainment. Dialogue, plot, acting, it’s all terrible and it’s all amazing. The late 1980’s were not kind to Linda Blair - a theme we will be exploring for much of Blairvember 2017 - and The Chilling is no exception. She has stated in interviews that during this time period she was jumping from set to set with little regard for what she was actually making; that is extremely apparent in this movie. Her performance is fine but is unrefined and reeks of someone who read the script on a flight from her last shoot. Dan Haggerty is a different story altogether. Not known for his quality movie choices, Haggerty is right at home with his mumbling lines and aloof nature. It’s typically distracting to see an actor disinterested in the work and eager for that paycheck but Haggerty always seems to pull it off in spite of himself. Like his appearance in Elves, he sleepwalks his way through this movie and creates a watchable mess that signals to the audience that it’s OK to laugh. The most interesting thing about this film is its insistence on taking a moral high ground for an issue it has no interest in talking about. 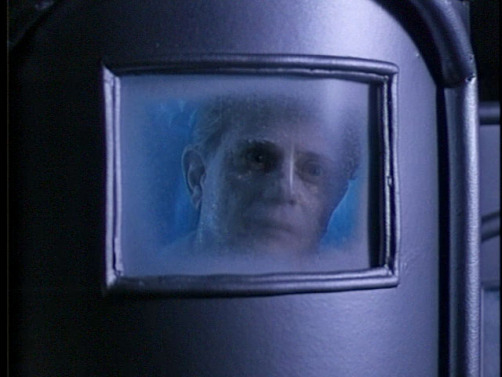 Cryogenics are presented in the opening credits as an affront to God and nature; something we should all be fearful of. We then learn that there are actually no cryogenics going on and everyone just becomes a zombie. The point or consequence of the opening warnings and characters harassing others for their beliefs in cryogenics and science? Nothing. The Chilling is hardly high art but it’s a worthy movie for the Blairvember cannon and something that’s worth digging up if your bored on a weeknight and need a good laugh; or need to fall asleep.